Job Requests are currently closed. We look forward to serving you next year! Complete your profile and digitally sign participation documents. Help make The Big Event happen! The Big Event was founded at Texas A&M University in 1982. Since then, The Big Event has expanded to over 100 schools across the country, all joining together in the spirit of service. 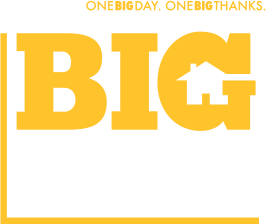 The first annual Big Event was held at the University of Wyoming in the fall of 2013 as the kick-off to homecoming week with just over 300 students participating. Now, in our 6th year, we expect 1000 students to say "Thank You" to their community and participate in The Big Event. The Big Event strives to uphold the ideals of unity and service. This one-day event is not based on socioeconomic need, but rather is a way for the student body to express their gratitude to the entire community which supports the university. It is important to remember The Big Event is not about the number of jobs completed or the number of students who participate each year. Instead, it is the interaction between students and residents and the unity that results throughout the community that makes The Big Event such a unique project. If you have questions about The Big Event, please reach out!